Just for a moment, we want you to cast aside your ecommerce marketer hat and focus on the online shopper in you. It’s the first week of December and your housemate receives a Christmas brochure through the post. You’ve never heard of the brand before so check them out on Instagram. Their feed is packed with gift ideas, seasonal offers and snaps of snow covered trees and fairy lights framing cottage windows...Nice! You visit the brand’s website and are impressed with its beautiful festive imagery and responsive design, so decide to sign-up to their newsletter. Disappointingly, the welcome email you receive is void of festive cheer; just a bog standard ‘Thank you’ alongside a picture of a wreath-less front door. Where’s the Christmas spirit gone? Okay, you can put your ecommerce marketer hat back on now. So, why are we telling you this? Because we want to focus on the fact that, all too often, triggered emails get left behind at Christmas time. This is surprising: automated campaigns continually outperform regular emails when it comes to open and click-through rate, and are consequently a great opportunity to get your key Christmas messages in front of shoppers. Moreover, triggered emails help ecommerce marketers do their job during one of the busiest times of the year by - for example - welcoming new customers, or reminding existing ones of forgotten items. But still, whilst marketers tend to go all out on direct mail, newsletters and social media during the Christmas period, automated emails can’t expect as much as a seasonal makeover. 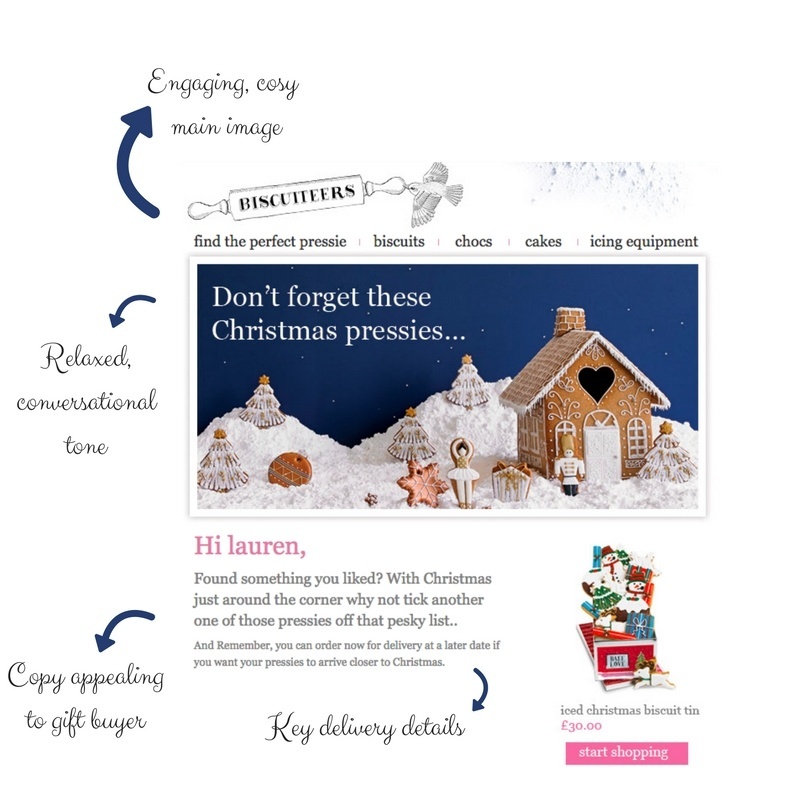 So, let's take a look at a few actionable ways you can give your triggered emails a festive update this season, in order to: maximise profit, increase customer engagement and ensure your Christmas messages reach those who matter most. Thanks to gift shoppers, the Christmas period is prime time for new customer acquisition, so make the most of all those new visits by ensuring your email signup box is as prominent as possible. Once you’ve acquired an email address, your welcome series is a great opportunity to deliver your brand’s Christmas offering in a speedy, effective way. However, as shown in the example above, nowhere near enough brands seem to have cottoned onto this yet, and instead continue to send the same old welcome series throughout the year. Giving your welcome series a festive twist is relatively easy, and very effective. 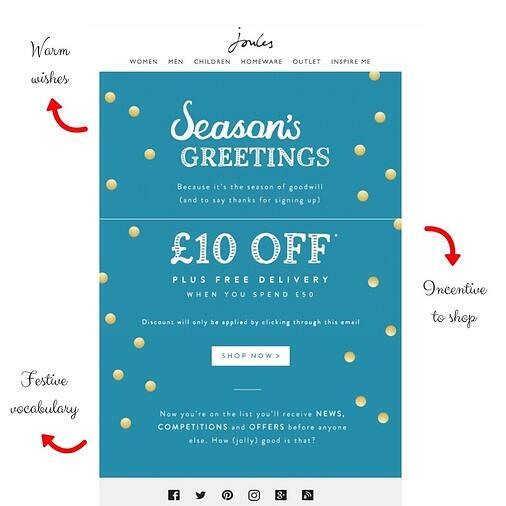 As shown in the Joules example below, just a few tweaks - such as Christmas themed copy and a more generous first-purchase discount - can make all the difference. If your regular welcome series is a brand building exercise, it could be worth waiting until after the festive period to send these key messages and focus on Christmas for the time being. If an existing customer has visited your site several times but not actually made a purchase, consider sending them a festive browse abandonment message to get them across the line. This is especially true for customers who bought last Christmas. Here’s a nice triggered email template currently being used by Biscuiteers, designed for those who have browsed a product more than once in a set period of time, but not made a purchase. Again, include key delivery details: customers are more likely to be interested in delivery times/methods etc around this time of year, so key details like this could swing a purchase. If you have one, include a link to your “gift guide”. Create sense of urgency: e.g. “Order by midnight 20th December for guaranteed Christmas delivery”. Implement back-in-stock trigger notifications for subscribers that left your page after being notified an item had sold out. Closely linked to browse abandonment comes cart abandonment. With Christmas lists, office parties and secret santa, Christmas is *the* season for spontaneous, less planned purchases, so ensure your abandonment emails are quick off the mark (preferably within the first hour of abandoning). Likewise, if you’re sending any follow-up cart abandonment emails, consider shortening the time frame between consecutive emails, This is especially true around key shopping dates, such as Black Friday and Cyber Monday, when shoppers are eager to their hands on what they want. Cart abandoners are even closer to conversion than browse abandoners, so draw attention to anything that might get them across line - whether it’s free delivery, urgency about delivery dates or low stock. Don’t forget to include product recommendations - they’re a great way to target those having second thoughts about what was in their basket. 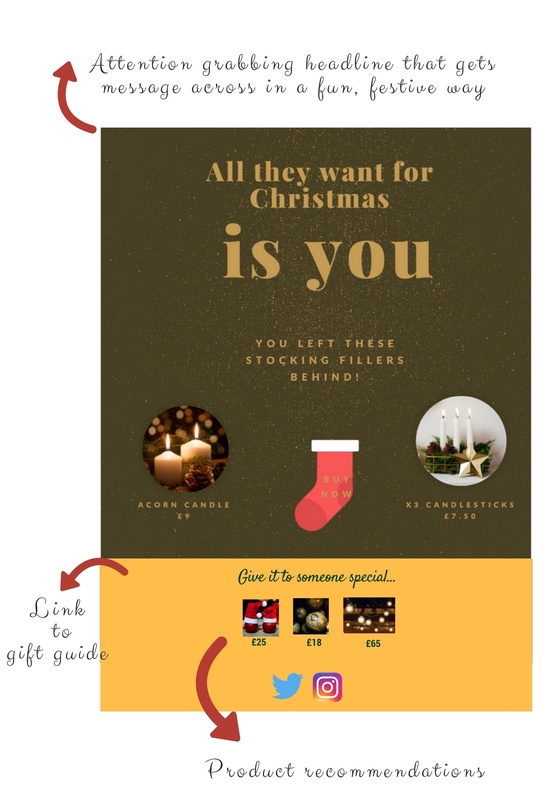 With a much higher open rate than regular email marketing, post-purchase emails are a golden opportunity for you to communicate your brand’s Christmas offering to existing customers during the festive season. But you wouldn’t think this looking at the generic, scrooge-like post-purchase messages sent out these days. For a retailer, post-purchase emails are an effective way to reactivate shoppers in the weeks following their purchase, whether that’s through: supplying useful content, requesting a review or encouraging a follow-up purchase. Shorten the send time of your follow up emails so that they are guaranteed to arrive before Christmas. Include product recommendations based on, for example, a customer's taste profile, browsing/purchase history, your most popular items or favourites from your gift guide. 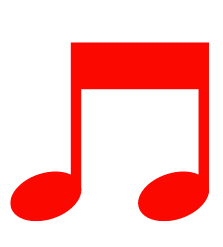 ... Do you hear what I hear? If your brand is going all out on Christmassy social media posts, direct mail and email newsletters, it only makes sense to also give your lifecycle messages a festive edge. If you don’t, your automated messages will risk coming across frosty - and not in a Christmassy way. Fun! Whether it’s a Christmas hat on your logo or mistletoe on top of your CTA, you’d be surprised how far little details go. Up-to-date: If, for example, your Christmas delivery information changes mid month, make this adjustment on your triggered emails. Likewise, it’s likely your customers’ needs will alter during the lead-up to Christmas, so adjust accordingly. Genuinely useful: As many of us know, gift shopping can be stressful - use your triggered emails to help your customers as much as possible!